Single-family home rents are barely budging after years of steep increases, and those declining returns could persuade some landlords to sell their houses, adding much-needed inventory to the home-buying market. 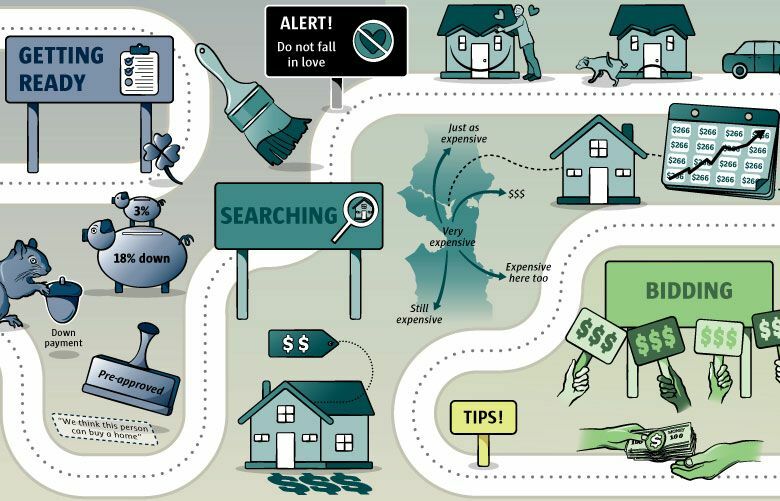 Houses with yards and driveways aren’t just for homeownership: You might be surprised to know that 1 in 6 single-family houses across the Seattle metro area is actually rented out. Single-family home rentals are especially important for families who can’t squeeze into a 1-bedroom apartment but don’t have the money to buy a house. They also are an option for groups of young singles to save on rent by splitting a bigger space. Now there is finally good news for them after years of steep rent hikes – and there’s a chance that could ultimately help lead to relief in the homebuying market, as well. Rents in local single-family homes rose a paltry 0.4 percent in February from a year ago, according to a new report from the real-estate data firm CoreLogic. 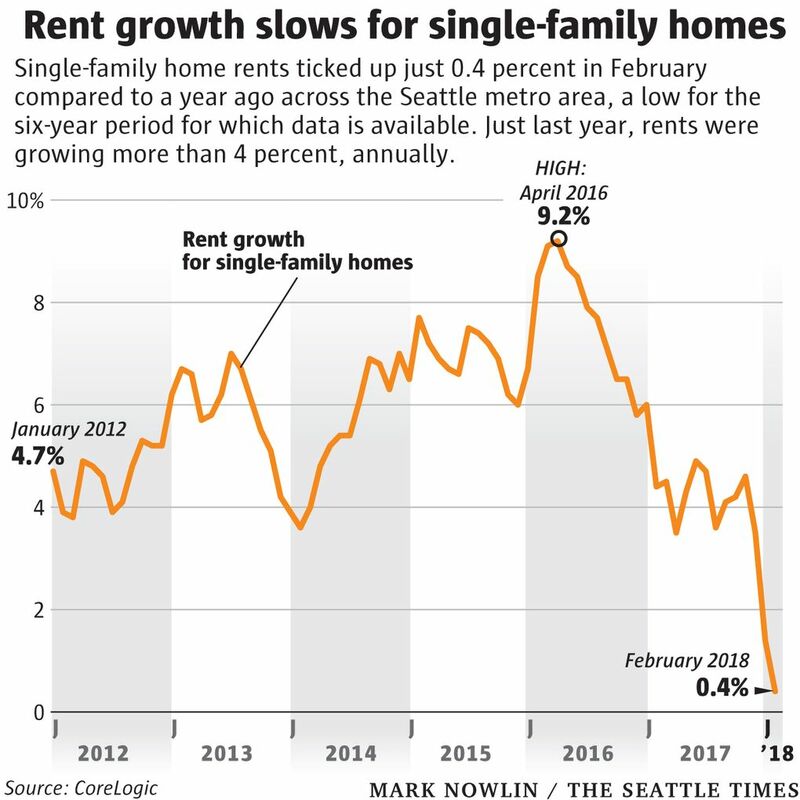 That’s by far the smallest growth since the company began tracking the data in 2011, and is way down from the average single-family rent hike of 5.8 percent this decade. And the shift has been sudden: Last year, rents rose about 4 percent. Just two years ago, rents were soaring as much as 9 percent annually. “One, two, three years ago, we would literally have people move out and we’d be there to do a quick cleaning, and change the locks, and have someone literally move in a couple hours later. We didn’t lose a day of rent,” said Chris Benis, who rents out a dozen houses on the Eastside. Some tenants would even rent houses sight unseen. But in the last couple months, two of his houses became vacant and drew just one tenant application each, and it took about a month to rent out each house. “We didn’t have people banging down the door to rent” them, Benis said. Of course, that doesn’t mean you can suddenly rent a house on the cheap. Across the entire metro area – spanning from Tacoma to Everett – the average house now rents for $2,730 a month, according to CoreLogic. Compare that with $3,590 in Los Angeles – but $2,020 in Miami, $1,950 in Chicago, and $1,770 in Austin. At first blush, this new trend of slow rent growth makes sense – it lines up with what we’ve been seeing in the rest of the rental market here. Rents at Seattle-area apartment buildings have also cooled way down recently, and are actually below their highs reached last summer. But dig deeper and it’s a bit confusing: Experts have pinned the apartment-rent slowdown on the record number of new apartments flooding the market. The supply of single-family houses for rent, on the other hand, hasn’t changed at all in recent years, and yet house rents have eased, anyway. Julie Purchase, principal of Avenue One, which manages about 600 single-family home rentals in Greater Seattle, said the huge jump in new apartments has had a chilling effect on the home rental market, too. While the vast majority of the new apartments opening are studios and 1-bedrooms – not exactly a good alternative for families renting a house – roommates who split a house now have so many more rental options to choose from. The data back this up. Molly Boesel, principal economist for CoreLogic, said the number of available homes for rent on the local market has jumped about 20 percent in the last year, even though the total number of houses here hasn’t really increased. A sell-off of rental homes could help ease the historic shortage of houses for sale here, which has helped drive up prices to record highs. The region, and the rest of the country, saw a huge spike in homes being taken off the for-sale market and converted to rentals in the aftermath of the recession, when investor companies began buying homes for cheap as the housing market crashed and regular buyers couldn’t get mortgages. 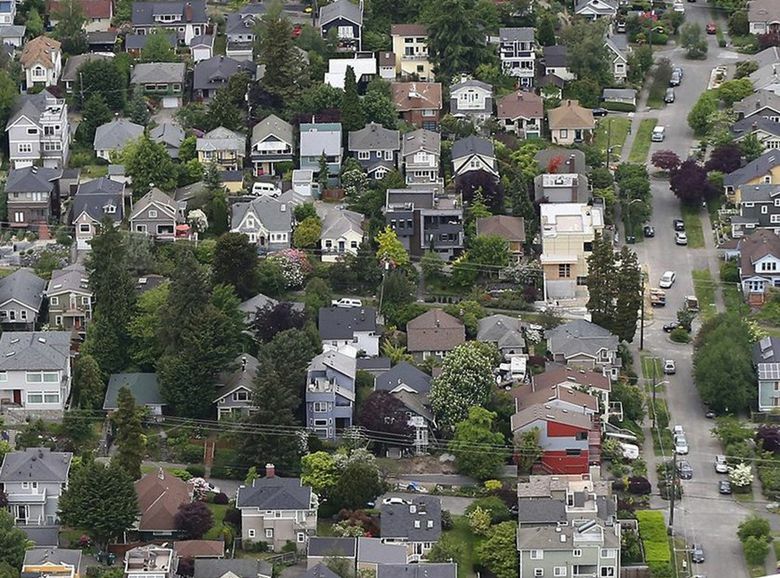 At one point in the frenzy, Wall Street-backed Invitation Homes was buying 10 homes a day in the Seattle area, and wound up with more than 1,500 homes here in total. From 2000 to 2008, about 13 to 14 percent of all single-family homes in the area were rented out, according to a Zillow analysis of Census data. Since 2009, however, about 16 to 17 percent of houses here have been rented out. The difference looks small but adds up: About 30,000 single-family homes across the region were converted from for-sale to rentals during the housing bust. In all, about 145,000 houses in the Seattle metro area are now rented out.